It has been a good year for Shastas here too. 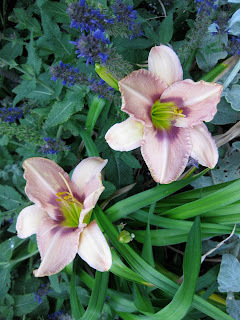 Love the daylily/salvia combo. I didn't know earwigs favor Shastas. I just bought one for the girl. Hopefully they'll content themselves with the Clematises instead. That's a beautiful Hemerocallis. The Salvia sets it off perfectly. I wonder why your carnation is sporting? It's lovely in original and intense. Gorgeous blooms in your garden. Thanks for sharing. Everything looks just right for June, Leslie! So far the Shastas have been 'cheerful and dependable' plants here, too. I haven't noticed earwigs on them, but sometimes cucumber beetles go for the pollen. How fun that you added a batfaced cuphea - is this plant one that lived over winter? My plants didn't like 13°F so I had to buy a new one. And yes, I had to buy it! Love the batfaces! I love your carnation with the tiny edging of pink. hi leslie, i really like the exotic echo lily / salvia combo - striking! How neat to find an all pink flower on your carnation:) I have several varieites but I don't have that one - the bicolor ones are my favorites. Your garden looks lovely and I'm so glad the earwigs are leaving those Shastas alone this year! Got home to London to find shastas had invaded my lawn. loved them, and was sad to have to mow them down. Will try to move them to a flower bed. I love all of your garden flowers. The best advice I was ever given regarding those nasty earwigs was to put a container with a couple ounces of cheap vegetable oil and add a couple dashes of no name soy sauce. They love the soy and the oil won't let them escape. In one summer I am sure I eliminated well over a thousand and the next summer there were very little.